The following instruction was released by the Department of Defense on February 27, 2013.
a. Establishes DoD policy, assigns responsibilities, and provides procedures for DoD support to Federal, State, tribal, and local civilian law enforcement agencies, including responses to civil disturbances within the United States, including the District of Columbia, the Commonwealth of Puerto Rico, the U.S. Virgin Islands, Guam, American Samoa, the Commonwealth of the Northern Mariana Islands, and any territory or possession of the United States or any other political subdivision thereof in accordance with DoDD 3025.18 (Reference (c)). b. Prescribes the regulations required by section 375 of title 10, United States Code (U.S.C.) (Reference (d)). c. Incorporates and cancels DoDDs 3025.12, 5525.5, and 5030.46 (References (e), (f), and (g)). a. DoD shall be prepared to support civilian law enforcement agencies consistent with the needs of military preparedness of the United States, while recognizing and conforming to the legal limitations on direct DoD involvement in civilian law enforcement activities. b. Support of civilian law enforcement agencies by DoD personnel shall be provided in accordance with sections 112, 351, 831, 1116, 1751, and 1385 (also known and hereinafter referred to as “The Posse Comitatus Act, as amended”) of title 18, U.S.C. (Reference (n)); chapter 18 of Reference (d); section 1970 of title 2, U.S.C. (Reference (o)) (for support to the U.S. Capitol Police); and other Federal laws, including those protecting the civil rights and civil liberties of individuals, as applicable. (1) The primary restriction on DoD participation in civilian law enforcement activities is the Posse Comitatus Act. It provides that whoever willfully uses any part of the Army or the Air Force as a posse comitatus or otherwise to execute U.S. laws, except in cases and under circumstances expressly authorized by the Constitution or Act of Congress, shall be fined under Reference (n), or imprisoned not more than 2 years, or both. (2) Section 375 of Reference (d) provides that the Secretary of Defense shall prescribe such regulations as may be necessary to ensure that any activity (including the provision of any equipment or facility or the assignment or detail of any personnel) under chapter 18 of Reference (d) does not include or permit direct participation by a member of the Army, Navy, Air Force, or Marine Corps in a search, seizure, arrest, or other similar activity unless participation in such activity by such member is otherwise authorized by law. 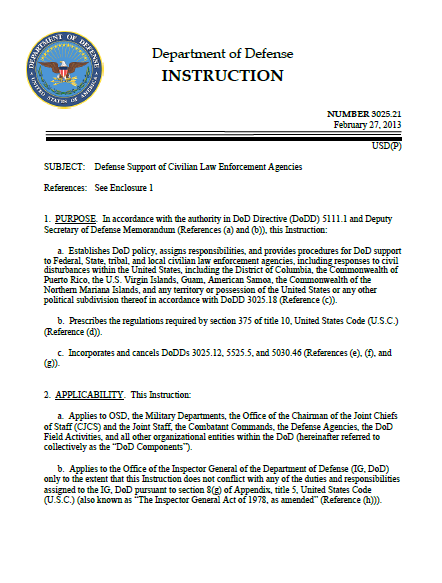 (a) Investigations and other actions related to enforcement of chapter 47 of Reference (d) (also known as “the Uniform Code of Military Justice”). (c) Investigations and other actions related to a commander’s inherent authority to maintain law and order on a DoD installation or facility. (d) Protection of classified defense information or equipment or controlled unclassified information (e.g., trade secrets and other proprietary information), the unauthorized disclosure of which is prohibited by law. (e) Protection of DoD personnel, equipment, and official guests. (f) Such other actions that are undertaken primarily for a military or foreign affairs purpose. (2) Audits and investigations conducted by, under the direction of, or at the request of the IG, DoD, pursuant to the Inspector General Act of 1978, as amended. (b) When duly constituted Federal, State, or local authorities are unable or decline to provide adequate protection for Federal property or Federal governmental functions. Federal action, including the use of Federal military forces, is authorized when necessary to protect Federal property or functions. (4) DoD actions taken pursuant to sections 331-334 of Reference (d) relating to the use of Federal military forces in specified circumstances with respect to insurrection, domestic violence, or conspiracy that hinders the execution of State or Federal law. (a) Protection of national parks and certain other Federal lands consistent with sections 23, 78, and 593 of title 16, U.S.C. (Reference (w)). (b) Enforcement of the Fishery Conservation and Management Act of 1976, as amended, pursuant to section 1861(a) of Reference (w). (c) Assistance in the case of crimes against foreign officials, official guests of the United States, and other internationally protected persons pursuant to sections 112 and 1116 of Reference (n). (d) Assistance in the case of crimes against Members of Congress, Members-of-Congress-elect, Justices of the Supreme Court and nominees, and certain senior Executive Branch officials and nominees in accordance with section 351 of Reference (n). (e) Assistance in the case of crimes involving nuclear materials in accordance with section 831 of Reference (n). (f) Protection of the President, Vice President, and other designated dignitaries in accordance with section 1751 of Reference (n) and Public Law 94-524 (Reference (x)). (g) Actions taken in support of the neutrality laws in accordance with sections 408 and 461-462 of title 22, U.S.C. (Reference (y)). (h) Removal of persons unlawfully present on Indian lands in accordance with section 180 of title 25, U.S.C. (Reference (z)). (i) Execution of quarantine and certain health laws in accordance with section 97 of title 42, U.S.C. (Reference (aa)) and DoDI 6200.03 (Reference (ab)). (j) Removal of unlawful enclosures from public lands in accordance with section 1065 of title 43, U.S.C. (Reference (ac)). (k) Protection of the rights of a discoverer of an island covered by section 1418 of title 48, U.S.C. (Reference (ad)). (l) Support of territorial governors if a civil disorder occurs, in accordance with sections 1422 and 1591 of Reference (ad). (m) Actions in support of certain customs laws in accordance with section 220 of title 50, U.S.C. (Reference (ae)). (6) Actions taken to provide search and rescue support domestically under the authorities provided in the National Search and Rescue Plan (Reference (af)) and DoDI 3003.01 (Reference (ag)). a. The President is authorized by the Constitution and laws of the United States to employ the Armed Forces of the United States to suppress insurrections, rebellions, and domestic violence under various conditions and circumstances. Planning and preparedness by the Federal Government, including DoD, for civil disturbances is important due to the potential severity of the consequences of such events for the Nation and the population. b. The primary responsibility for protecting life and property and maintaining law and order in the civilian community is vested in State and local governments. Supplementary responsibility is vested by statute in specific agencies of the Federal Government other than DoD. The President has additional powers and responsibilities under the Constitution of the United States to ensure that law and order are maintained. c. Any employment of Federal military forces in support of law enforcement operations shall maintain the primacy of civilian authority and unless otherwise directed by the President, responsibility for the management of the Federal response to civil disturbances rests with the Attorney General. The Attorney General is responsible for receiving State requests for Federal military assistance, coordinating such requests with the Secretary of Defense and other appropriate Federal officials, and presenting such requests to the President who will determine what Federal action will be taken. d. The employment of Federal military forces to control civil disturbances shall only occur in a specified civil jurisdiction under specific circumstances as authorized by the President, normally through issuance of an Executive order or other Presidential directive authorizing and directing the Secretary of Defense to provide for the restoration of law and order in a specific State or locality in accordance with sections 331-334 of Reference (d). (1) Guidelines concerning the use of deputized State or local law enforcement powers by DoD uniformed law enforcement personnel are outlined in Reference (ah). (2) Guidelines concerning the use of deadly force and/or the carrying of firearms by DoD personnel while engaged in duties related to security or law and order, criminal investigations, or counterintelligence investigations; protecting personnel; protecting vital Government assets; or guarding Government installations and sites, property, and persons (including prisoners) are outlined in Reference (ai) and any additional Secretary of Defense-approved rules for the use of force contained in Reference (aj). a. Federal military forces shall not be used for CDO unless specifically authorized by the President, except under emergency authority as provided in Reference (c) and subparagraph 1.b. (3) of Enclosure 3.
b. Federal military forces shall be made available for CDO as directed by the President. The Secretary of Defense or other authorized DoD official may, where authorized and consistent with the direction of the President, establish the source and composition of those forces to achieve appropriate balance with other national security or DoD priorities. c. Federal military forces employed in CDO shall remain under Secretary of Defense command and control at all times. d. The pre-positioning of Federal military forces for CDO shall not exceed a battalion-sized unit in a single location unless a larger force is authorized by the President. e. DoD Components shall not take charge of any function of civil government unless absolutely necessary under conditions of extreme emergency (e.g., when using emergency authority as described in Reference (c) and subparagraph1.b. (3) of Enclosure 3). Any commander who is directed, or undertakes, to control such functions shall strictly limit DoD actions to emergency needs and shall facilitate the reestablishment of civil responsibility at the earliest time possible.